The USD 250 Board of Education invites the public to meet Dr. Brad Hanson, one of two candidates for Superintendent of Schools for Pittsburg Community Schools, Wednesday, March 14th from 4-4:30pm at the Staff Development Center (300 E. 13th Street) next to Pittsburg Community Middle School. 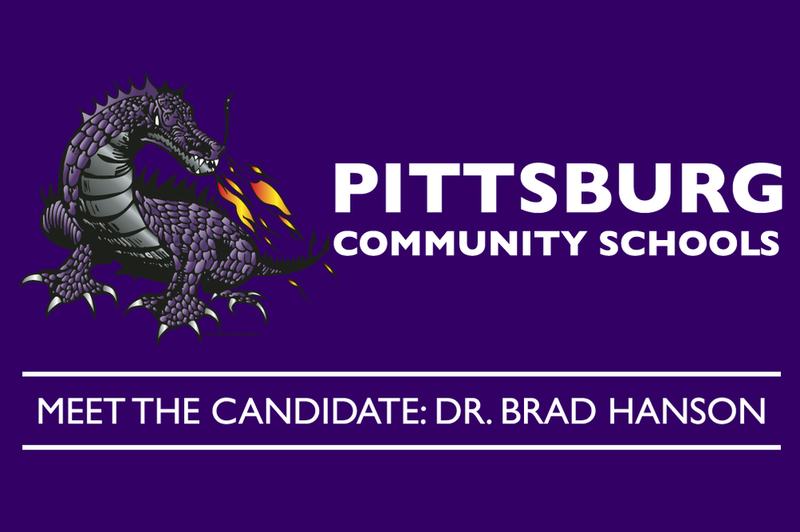 Dr. Brad Hanson, a Pittsburg, Kansas native, graduated from Pittsburg High School in 1981. He has served in public education for over 33 years, beginning his career in Arkansas at the Pulaski County School District as a science teacher and coach for the first nine years of his educational career. Dr. Hanson then moved to Missouri serving the Cassville School District for 16-years as a physical education teacher, coach, and a building-level administrator. Dr. Hanson currently serves as superintendent of schools for the Monett School District, a position he has held for the past six years. Dr. Hanson earned his Ed.D. in Educational Administration from Lindenwood University in 2014. He has also earned an Ed.S. In Educational Administration from Missouri State University in 2007, an M.S. in Physical Education from the University of Central Arkansas in 1989, and a B.S.E. in Physical Education from the University of Central Arkansas in 1986. Dr. Hanson is an active member of the Monett Community, serving on the Cox Monett Hospital Advisory Board, the YMCA Board, the Monett Area Community Foundation Board, the Monett Kiwanis Club Board, and the Monett Economic Development Partnership Committee. He also currently serves as the Board President of the Southwest Center of Educational Excellence, an educational cooperative located in Webb City, Missouri. In addition, Dr. Hanson is an active member of the American and Missouri Associations of School Administrators and the Missouri School Administrators Political Action Committee. Dr. Hanson and his wife, Jennifer, have three grown children: Adam (Frontenac, KS), Abby (Highlandville, MO), and Ali (Springfield, MO). They also have three grandchildren: Briley, Whitley and Kinsley Hanson. He enjoys spending time with family, an occasional round of golf, and attending all types of sports activities.